His name may be Ross…but if he were one of the famous Friends, think of him more as Chandler. 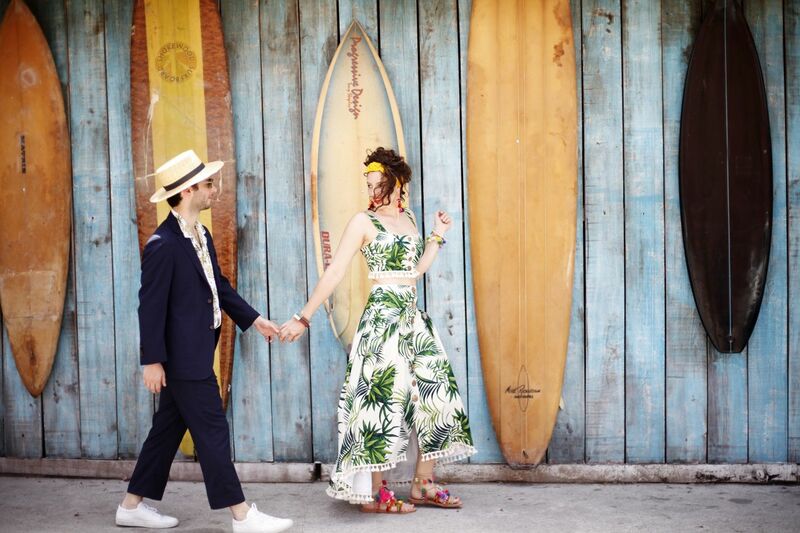 Ross Harrow met Amirah Kassem—she plays Monica in this love story—in Brooklyn. The two were neighbors and she whipped up a batch of her famous cake balls to welcome him to the neighborhood. Amirah thought Ross was dreamy; Ross thought Amirah was “out of his league,” and the two became fast friends, which quickly turned into more. 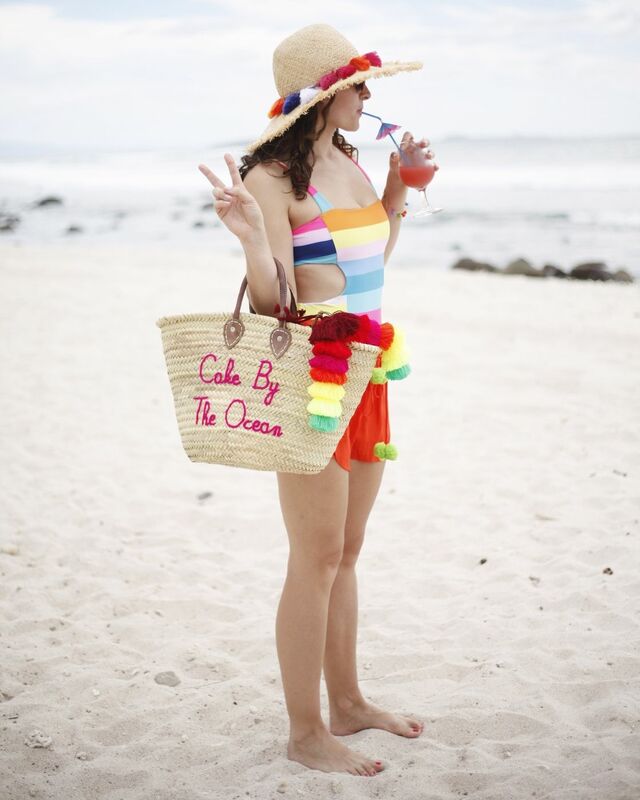 “Ross would come play the guitar while I baked cakes, so it was either his voice or my cakes that sparked the magic,” recalls Amirah, who has since founded Flour Shop, a whimsical, pop-colored cakery in partnership with Ross. 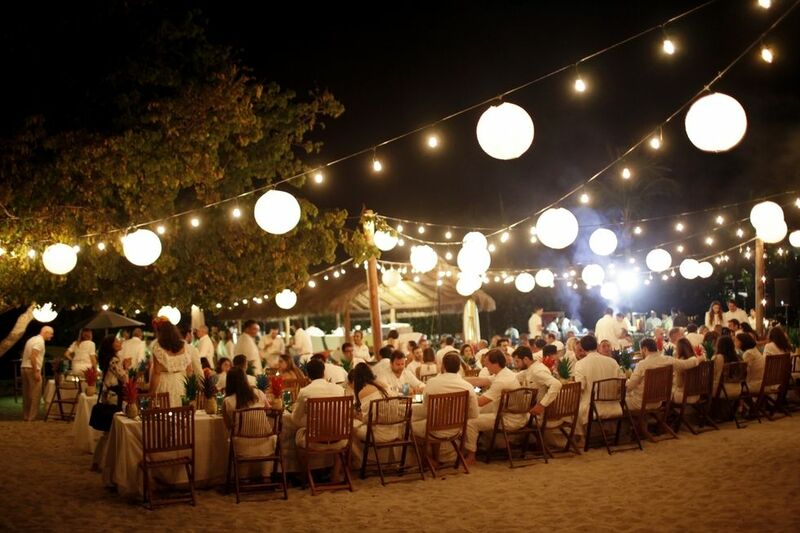 The fiesta extravaganza began with an oyster bar and cocktails on the beach. 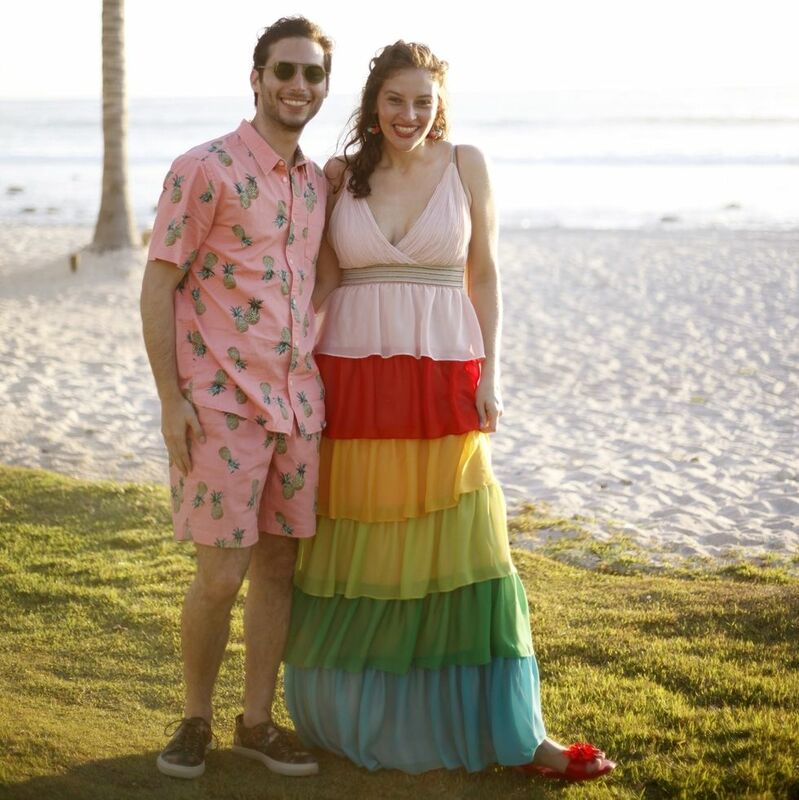 Appropriately, the colorful bride donned a rainbow sundress designed by her friend Stacey Bendet of Alice + Olivia, who gifted the dress to the bride for her shower. Amirah paired the look with a pair of Rebecca Minkoff pom pom earrings, kicking off the weekend in what would be one of many ample doses of bold hues. 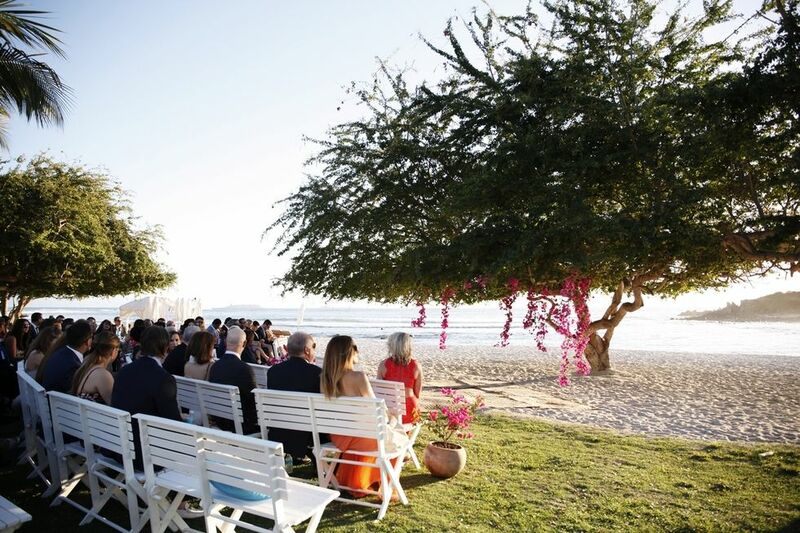 The groom followed suit, complementing Amirah’s look with a pink and pineapple ensemble, hinting to the couple’s tropical, food-forward wedding motif that would only appear in increasing doses as the wedding celebrations wore on. 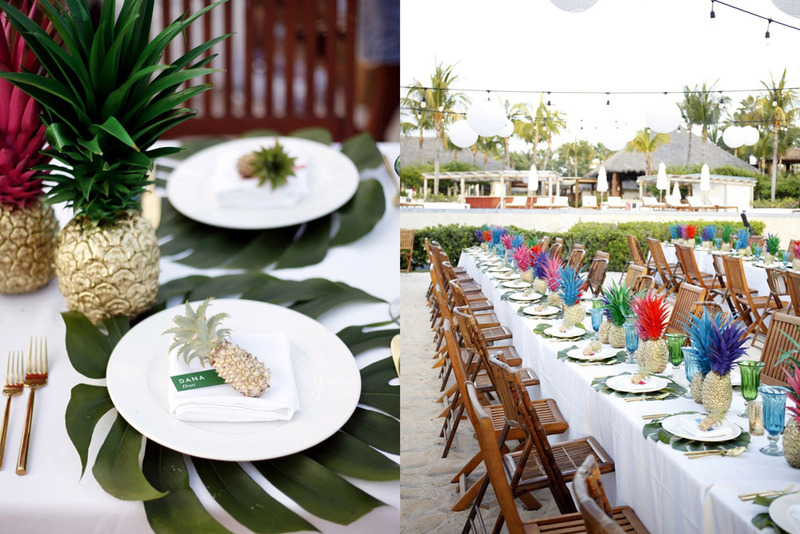 On Friday evening, guests gathered for a pineapple-themed rehearsal dinner on the beach, to play into the tropical surroundings and enjoy dinner and entertainment with the sounds of the waves crashing as a backdrop—until Ross took the stage and serenaded his future wife which a personal, surprise song he wrote for her in the months leading up to the wedding. 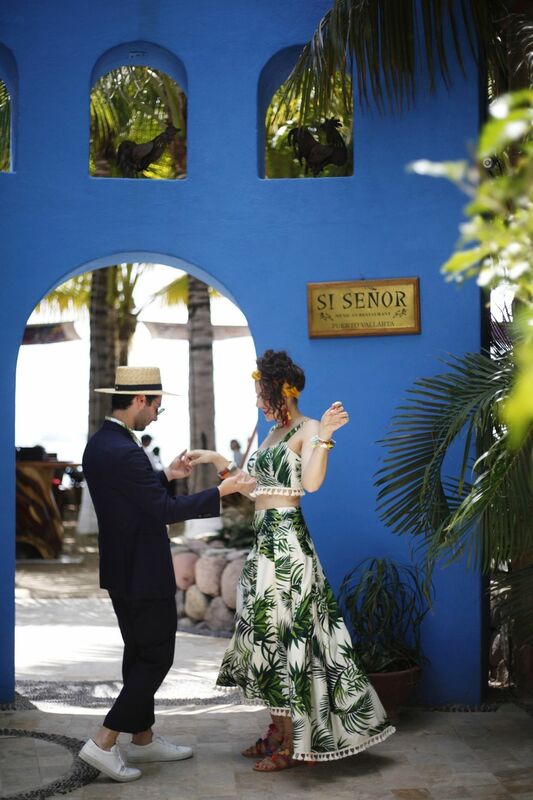 Ross wasn’t the only entertainment for the evening, though; the night started with a live Cuban band and wrapped up with a special fire performance from some of the world’s best jugglers—a hint at the otherworldly entertainment guests were likely to experience at the couple’s reception the following evening. 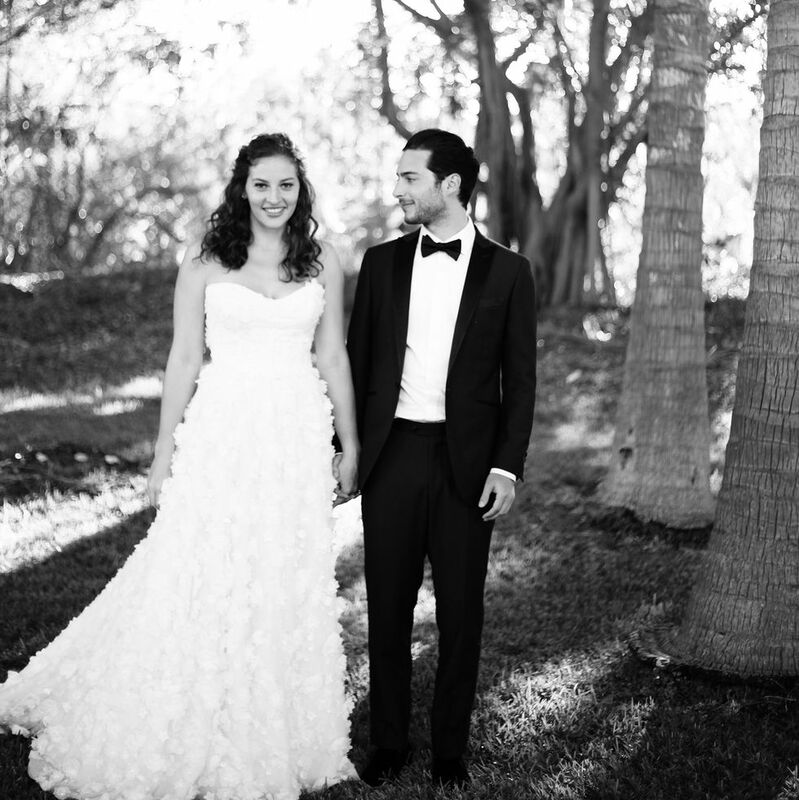 Amirah and Ross exchanged vows under a wide, slopping tree dripping with hot pink bougainvillea. 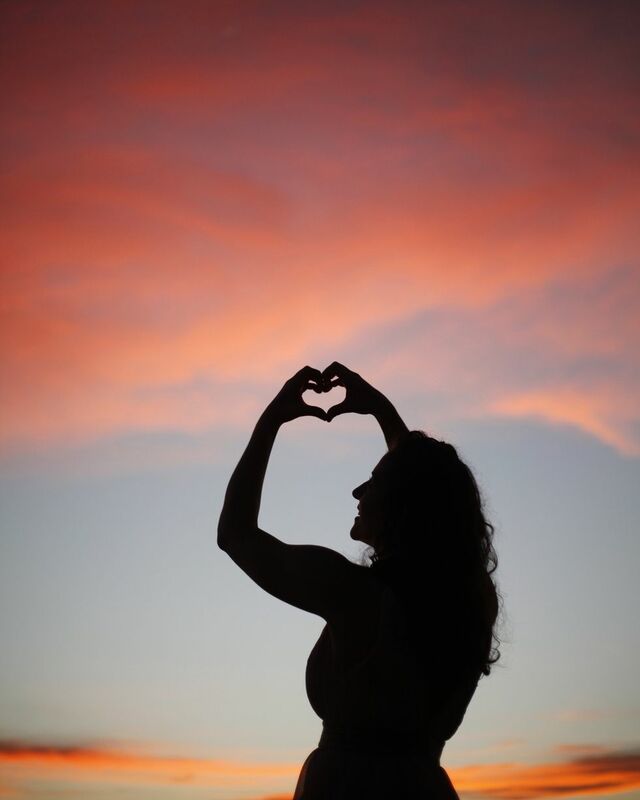 “Both of us fell in love with those trees from our first visit,” explained Amirah. 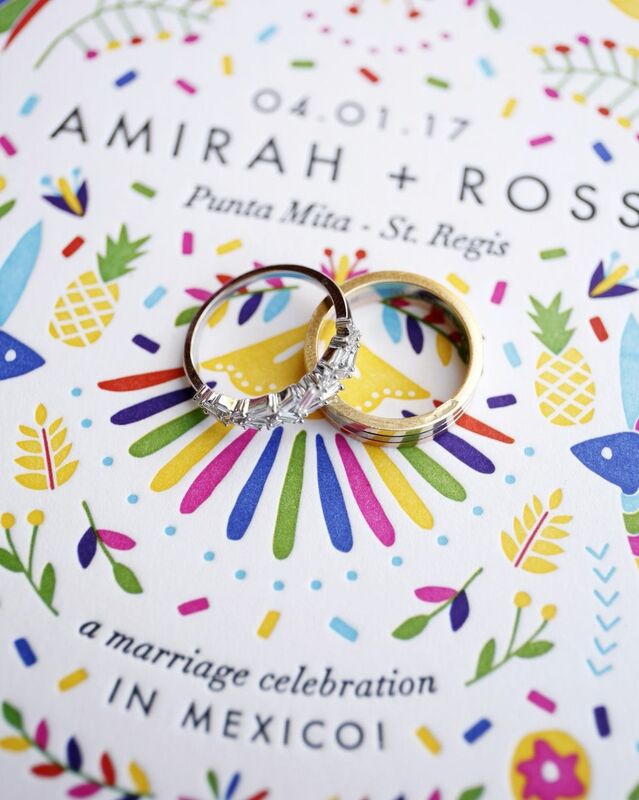 “They connect right where the beach sand meets the grass, so we thought it was the most beautiful, natural setting for the guests to watch the sun set during our ceremony.” Guests were seated in the round on white benches decked with colorful otomi pillows, facing the ocean as Amirah and Ross recited their vows. 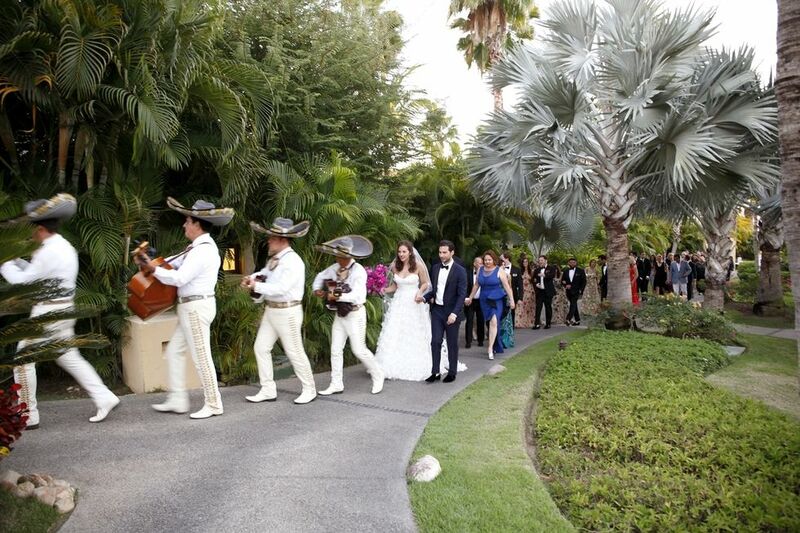 After the two were pronounced husband and wife, a mariachi procession lead guests to the reception in the hotel’s motor lobby. Yes, that’s a fancy word for driveway. 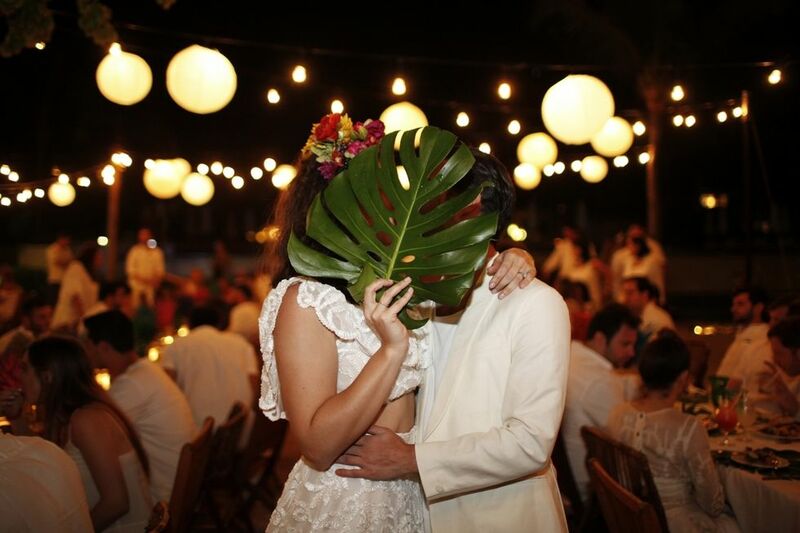 “Ross and I wanted an old colonial Mexican feel to the actual reception, without losing the perks of a beach-y, tropical weekend. 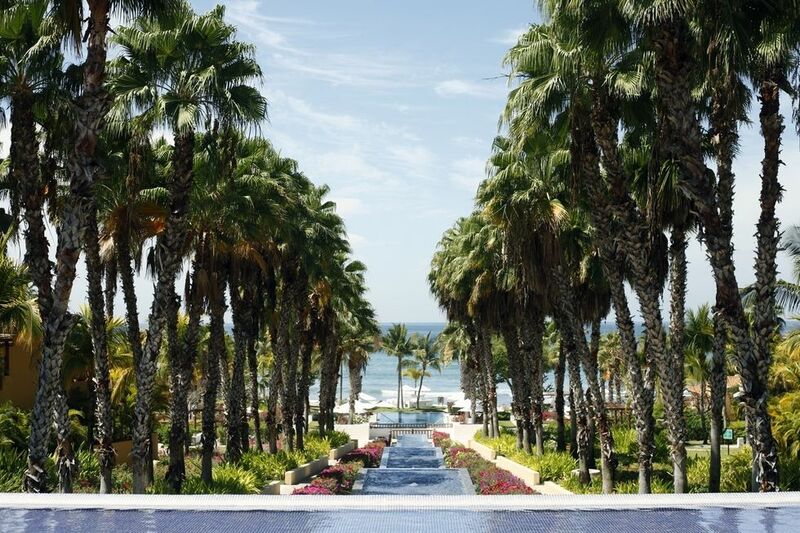 We first fell in love with the St. Regis in Punta Mita for its tropical environment and authentic food, but we didn’t want a traditional beach ceremony. 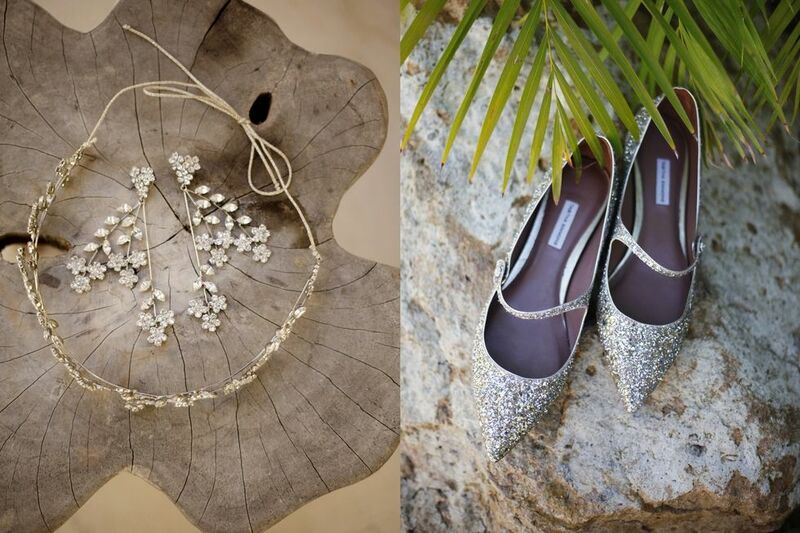 On our way out to dinner one night, Ross took a good look at the driveway and pointed out that it had the hacienda vibe we were looking for…I saw the whole night come together in those five minutes,” recalled the bride. Amirah and Ross focused on a “rustic Mexican” color palette of deep orange, vibrant yellows, deep reds and lots of blue and white for their wedding ceremony. 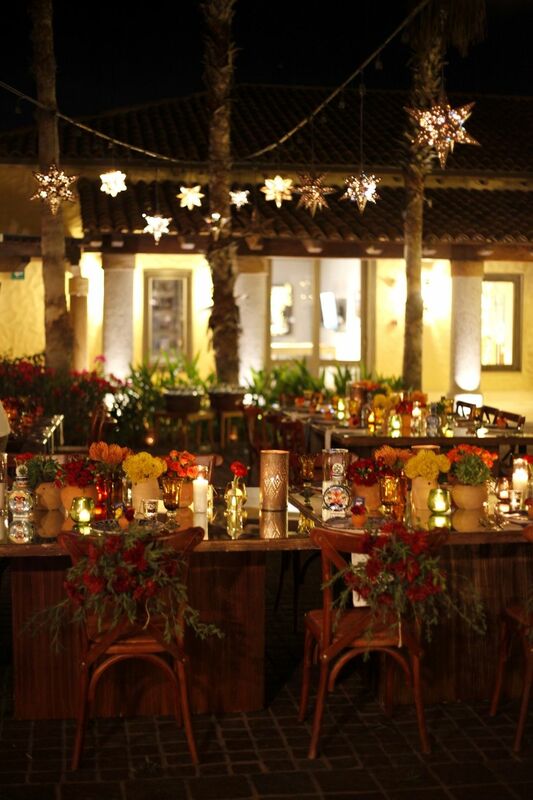 The reception focused more on autumnal tones, with a mixture of terracotta pots, Mexican candles, bowls of limes mixed with local flowers and cacti adorning the tables. “I wanted it to feel like Frida Khalo—as a centerpiece,” explained Amirah, who had the custom dinner plates hand painted with three different patterns to achieve the feel of authentic talavera plates. 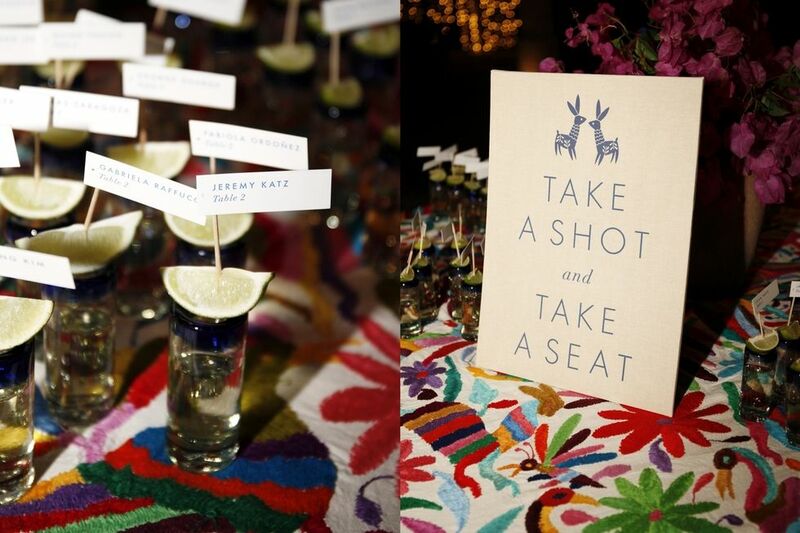 Table numbers were talavera house tiles and tequila bottles, and guests found their seats by finding their name and table number on the rim of hand-blown shot glasses of tequila. Guests enjoyed a three-course seated dinner, followed by the most epic dessert display created by the couple in collaboration with Chef Manuel Peruyero of the St. Regis. “The cake moment was a real ‘moment,'” explained Amirah. As someone who’d designed many wedding cakes in her day, creating her own required ample use of her industry intel—and the utmost in creativity. 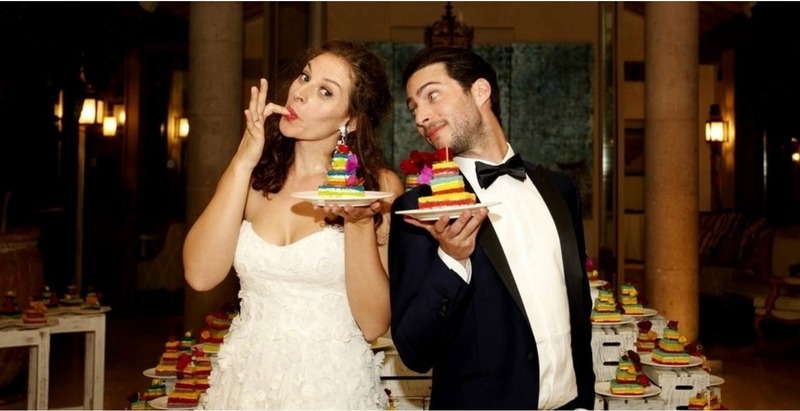 “Something people don’t always know [about weddings] is that although the bride and groom cut a beautiful cake, what actually gets served is a sheet cake precut in the kitchen. 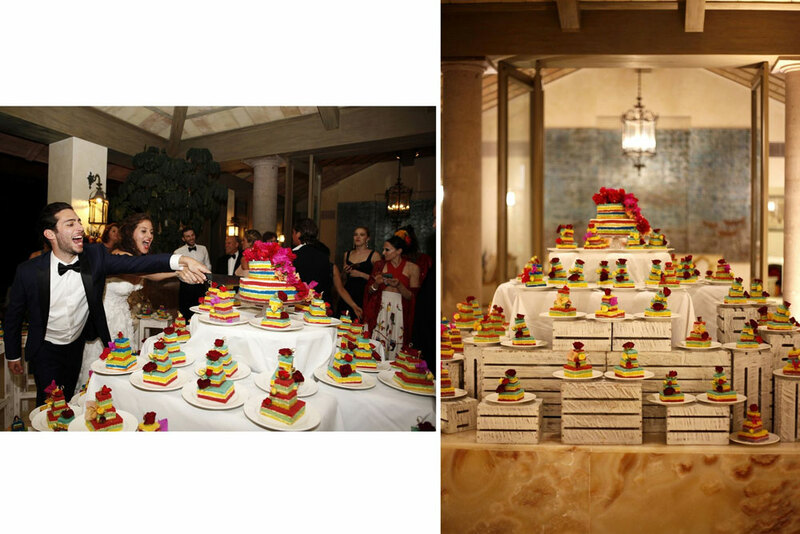 As a cake person myself, I think each slice is as important visually as the cake itself, so I worked closely with the pastry team at the St. Regis to create mini colorful wedding cakes—110 wedding cakes to be exact!—plus our larger cake. We turned the hotel lobby into a cake room and had all the cakes displayed in the middle of the room that was revealed when we cut into our cake, so all of our guests could walk in and grab their very own mini cake. Naturally, dessert didn’t stop at cake; the couple also had a churro cart making fresh churros for guests to enjoy as well. 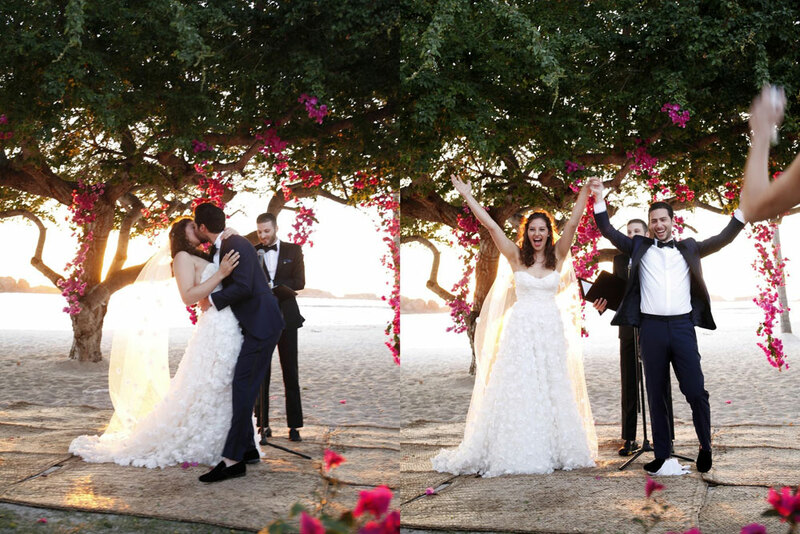 The couple hit the dance floor for the first time as a married couple to Ed Sheeran’s “Thinking Out Loud,” which very quickly transitioned into Pharell’s “Happy” to welcome their guests on to the floor. 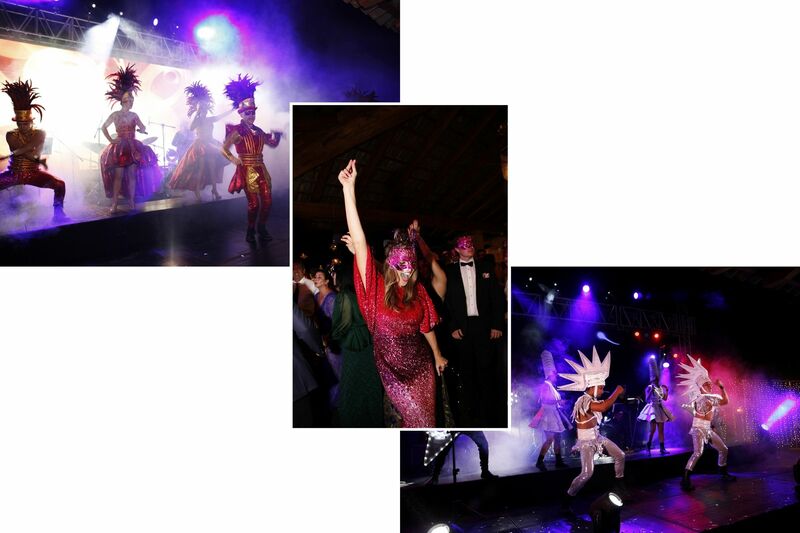 Then, the performances began: “Hector Tirado Musicales put on the best show you can ever imagine! They had about 16 people on stage and about 20 outfit changes,” remembered Amirah. 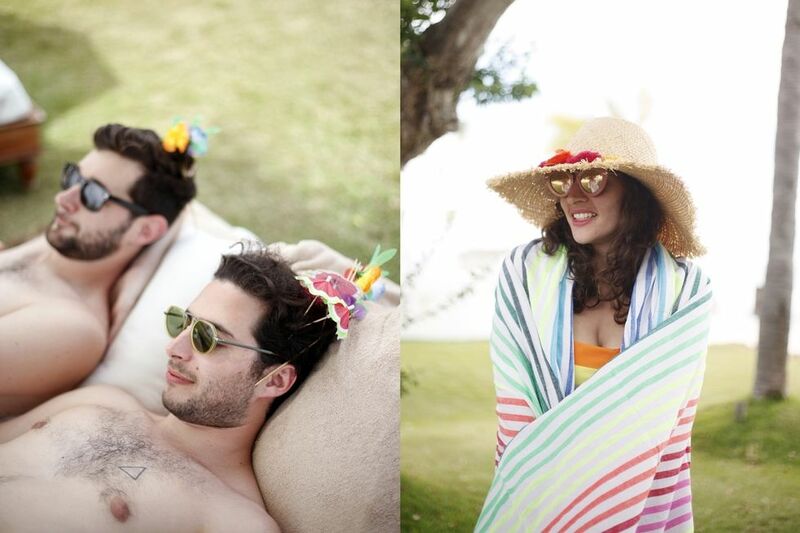 Rather than your standard wedding band, this was more of a spectacular-meets-music festival. 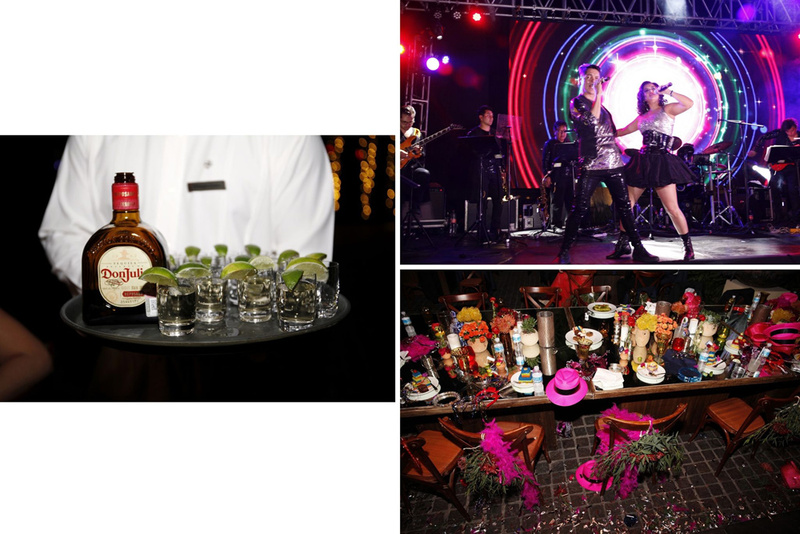 Props, favors, confetti canons and giveaways for every other song made the mood lighthearted, over the top, and non-stop fun. The most incredible performances at the reception lead to an after party that lasted until 5am; or at least that’s when Amirah and Ross made their exit. 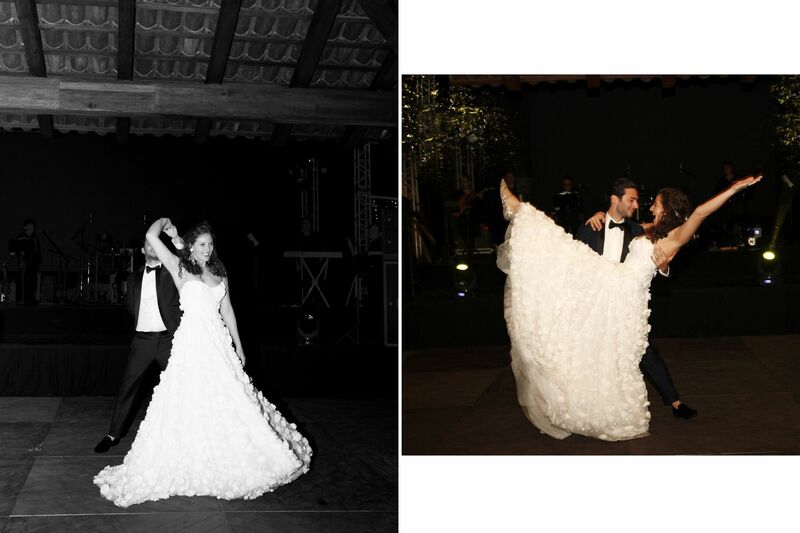 “We continued the party in a silver metallic room with a DJ and a colorful photo booth,” said Amirah. 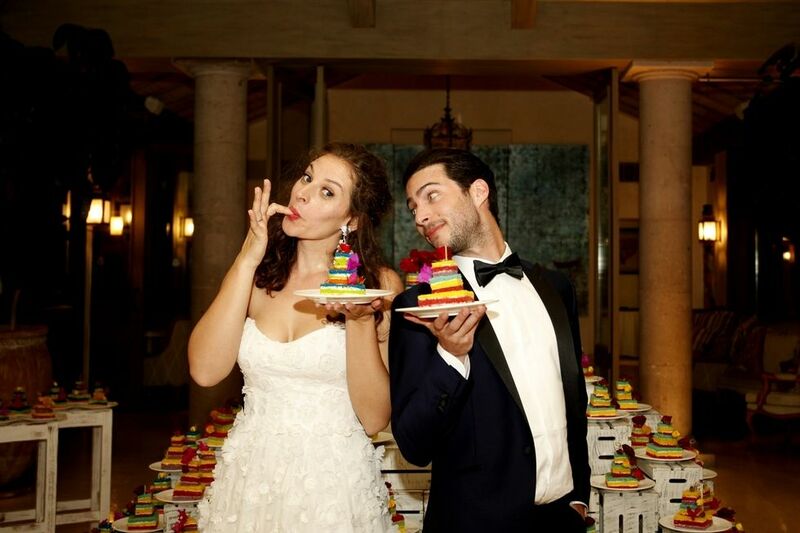 As bakers do, the couple made sure to supply their guests with all the late night snacks they’d need to stick around and enjoy the party, from metallic macaroons and brownies to savory bites, like mini burgers and empanadas.